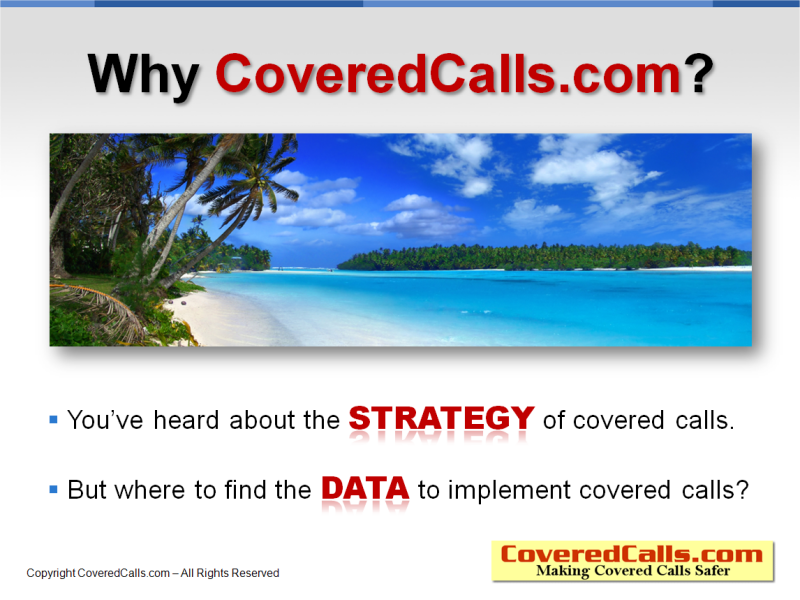 Welcome to the most popular Covered Calls data site on the Internet! We have been in the Covered Calls data business since 1997, and are one of the original options data vendors on the web. CLICK HERE to receive our FREE monthly CoveredCalls.com Newsletter! 295 total CC plays today. Sign-up now to access all CC data! Monthly CC training Webinar! Join us for our "live" training event each month, which is FREE with your subscription! seatbelt investingTM (SBI)...qualify to access our amazing WEEKLY covered calls data. The WEEKLYS are the hottest thing in the options world today...and we have 'em! Learn how to trade weekly options today. Thanks for your fantastic web pages. Copyright © 2019 CallsAndPuts.com, LLC. All Rights Reserved.